Who do we call to get the last week of our lives back? 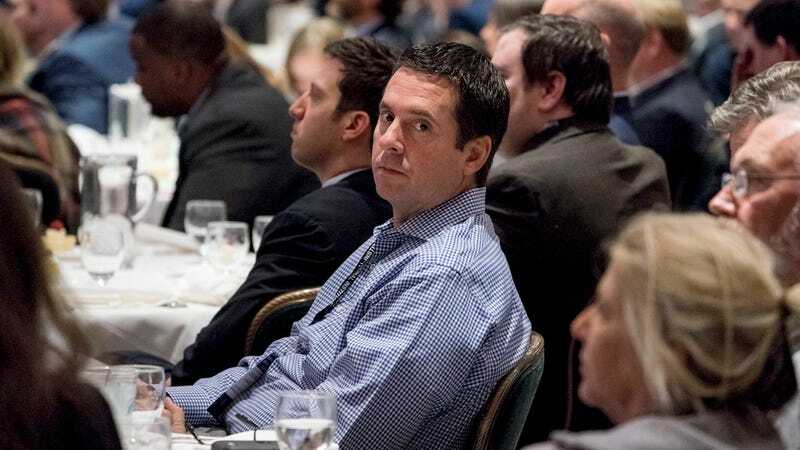 Rep. Devin Nunes, the godfather of disappointment, released his memo on Friday, capping off another chapter in the life of the California congressman and chairman of the House Intelligence Committee who exists solely to ingratiate himself to President Trump. The memo is positioned as some sort of smoking gun that stops just short of claiming the FBI colluded with the Clinton campaign to stop Donald Trump from becoming president. But the central premise around the memo—that a controversial dossier was used to launch a politically motivated FBI investigation into members of the Trump team—is totally contradicted by what the memo actually says. So this warrant will not help further the narrative that the FBI was spying on the Trump campaign, an allegation for which the president—who has absolute constitutional authority to declassify information whenever the hell he wants—has produced zero evidence. The memo further indicates that the FISA warrant was granted, in part, due to allegations raised in the dossier authored by former British spy Christopher Steele. It indicates that the FBI would not have pursued the warrant without the dossier and it notes that Steele was not a fan of President Trump. None of this is explosive. And the notion that the Steele dossier alone is enough to convince four judges on the Foreign Intelligence Surveillance Court (FISC) to grant a warrant is patently ridiculous. The warrant was reauthorized three times, according to the memo, even after the controversy surrounding it exploded in the press. Applications for FISA warrants are rigorous; there’s simply no way the court kept reauthorizing the Page warrant solely based on the dossier. The allegation that Steele didn’t like Trump is easy enough to believe—more than half the country didn’t vote for him, so a lot of people don’t like him. But nowhere does the memo indicate that Steele faked, forged, or doctored any information presented to the FISC. It also doesn’t show that his political views led him to actively compromise the integrity of his work. The argument that we should be suspicious of Steele because he didn’t like Trump is a bad one: Should courts only acknowledge information from sources who favor the president? Only people who voted for Donald Trump can testify to character? As far as takes go, this one’s pretty bad. Steele apparently doesn’t like Trump—so what? Steele’s political leanings might matter politically, but suggesting they matter legally is a big stretch. Finally, all the way in the last paragraph, the memo notes that information about Trump campaign adviser George Papadopoulos, who pleaded guilty last October to lying to the FBI, “triggered” the FBI’s counterintelligence investigation into Russia. “[T]here is no evidence of any cooperation or conspiracy between Page and Papadopoulos,” it says. Even if so, references to Papadopoulos seem to undermine the central point Nunes is trying to make: that the investigation into Trump campaign associates stemmed from a dossier written by a guy who apparently didn’t plan on joining one of the president’s golf clubs. The FBI and the Justice Department vehemently opposed the release of the memo, and for good reason. Investigators rely on information received by human sources, many of whom will only speak to the FBI if they can do so in strict confidence. The memo doesn’t appear to compromise any confidential sources, but publishing it could, nevertheless, undermine faith sources have in the FBI’s ability to keep a secret. That members of Congress were able to release information about a classified warrant and for blatantly political purposes is truly startling. The memo goes on to report that Steele began communicating with members of the press about details contained in the dossier at the instruction of his employer, Fusion GPS. Doing so may have burned his bridges with the FBI, but what this proves otherwise is anyone’s guess. Republicans will find ways to spin the memo as explosive and damaging to the FBI’s credibility, and there are some who will praise Nunes’s actions, but the political cost of releasing the memo will extend far beyond the news cycle. It’s hard to imagine any of the FBI’s some 35,000 employees are pleased with either the White House or the GOP right now. The Republican Party has always prided itself on being the party that demonstrates the utmost respect and loyalty for law enforcement. They kind of fucked that up today. You can read the memo here, and an annotated version here. But once you do, be warned, you will not get those precious moments of your life back. Which Companies Are Standing Up to Government Surveillance of Your Data?